Tralev the world with tralev. 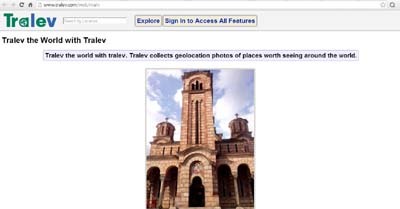 Tralev collects geolocation photos of places worth seeing around the world. Tralev tries to better solve the problem what to see when you are somewhere. You can use your Android smartphone to see images of interesting objects nearby and then get directions using Google Maps how to reach that place. Using Tralev.com website you can explore pictures of your next possible travel destinations. You can use Tralev to promote your website since information web page for each image can display your website.